If you are always in the moon this mod will be familiar, but this is the moon of Jupiter, whose name is Europe, the mod Europa Moon 1.3.2 allos you to create a portal into this new dimension. Like in the moon ther’s no oxygen, you must craft a spacesuit to protect you from adversity and allows you to breathe in the water and in space. Jupiter’s moon is a cold place, where we can find new objects and materials with which we can make new weapons. These new materials are Milomyte (the strongest and durable diamond-like), Vandyte, which is somewhat better than iron and Ice Crystal that is similar to iron, although apart from these materials will also find other things like ancient ruins and 5 new mobs. 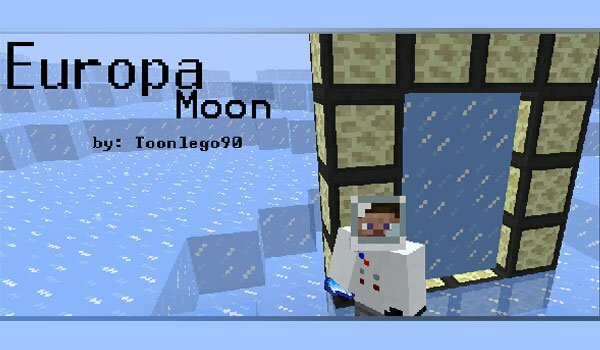 How to install Europa Moon Mod for Minecraft 1.3.2? Download Modloader, AudioMod and Dimension API. Paste Modloader files and Dimension AudioMod API. New spatial dimension for Minecraft!